Banana Bread Peanut Butter...HEY NOW!!! Ok, so I was skeptical that this flavor would have a very fake banana flavor but WOW, I could not have been more wrong! This tastes like spoonable banana bread and has a lot of exciting crunchiness to it, and when you put it on toast with sliced bananas, its like Banana Bread squared and you might actually slip into another banana bread related dimension. Highly recommend!!!! I would say it's my favorite, but they're all my favorite. I can't stop ordering! This particular almond butter is so smooth and tastes like a bite of actual banana bread. 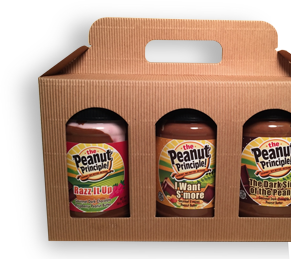 I will be adding it to my growing list of "must haves" from the Peanut Principle! Tried this at the farmers market in Larchmont for the 1st time 2 weeks ago, since then I've ordered an additional 6 jars, this stuff is absolutely delicious. I can't get enough of it and I have gotten to of my friends hooked on it. It is amazing!